Pristine Cleaning | Tired Of That Grout Looking So Dingy? Either on your bathroom floor, shower, kitchen floor or counter-tops, tile is tile and grout is grout. 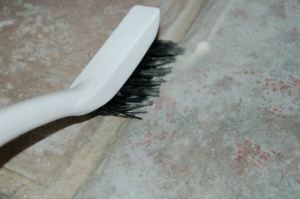 If you have continuous problems getting your grout cleaned or keeping it cleaned you may have grout that is not sealed. I will explain what you can do to clean and prevent future wasted time scrubbing that grout. The reason stains are embedded into your grout and you are unable to remove them is most likely because the grout is not sealed. Imagine a dry sponge, its very pours and if you poor liquid over it, it just absorbs in the pours. Well if you wrap that sponge in a plastic bag and pour liquid on it, it just beads right off. That is essentially what a sealer is designed to do. Sometimes depending on the stain, if your grout is not sealed you will not be able to remove it at all by yourself. Its best to call in a pro and see if they can work their magic. If they are able to remove the stain make sure you have them seal the area once they are finished. This will help you tremendously in the future and will be well worth the investment. Here are a few simple cleaning solutions you can make at home. – Sprinkle some baking soda onto the grout and spray vinegar on top of that. Let this solution fizz for a while. After about 30 minutes, wipe clean, or scrub with a toothbrush if necessary. Your grout should look much cleaner and brighter. Rinse with water. – Make a paste of hydrogen peroxide and baking soda. Apply paste to grout, let sit for at least 30 minutes and scrub with a toothbrush. Rinse with water. -TSP/Trisodium phosphate. You can purchase this from any Home Improvement store. Be sure to follow manufacturers instructions. If none of these clean your grout to your satisfaction you can use a heavy duty grout cleaner. Be sure to follow manufacturers instructions as well. If you know what you are doing you can use a high pressure washer. Just be sure you understand how to use this powerful tool before you attempt this in your home. ← Husband Leave Tracks Again?